What might you observe about a comet and how might you employ those observations to learn something useful from comets? some comets are regular visitors, with "short-period" orbits (P < 200 yrs; like Halley); others are "new," with orbital periods of greater than 2000 years. comets were considered vapors in our atmosphere (Aristotle) because they changed in appearance and because, prior to the Copernican Revolution, all celestial objects were considered to be perfect and changeless; thus, all objects that changed must exist "below" the moon. in January 1684: Edmund Halley met with Christopher Wren (architect of St. Paul's) and Robert Hooke (philospher) in a coffee house in London. They discussed the inability of old models to explain comet motions. 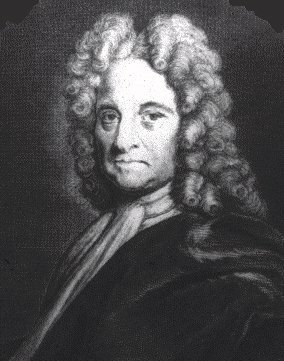 Upon a later visit to Newton, Halley expressed these frustrations, saying "why can't we figure out how these comets move?" Netwon replied that he already knew the answer: "they move in ellipses." Thus was born the Principia and the demonstration that the law of gravity is the source of Kepler's laws for orbits. in 1695 Halley predicted that the comet of 1682 would return in 1758, and that this comet was the same as that seen in 1607 and 1531. This was the first great prediction and triumph of Newton's law of gravity. Halley didn't live to see the comet return but his prediction was right. Historical records show Halley has been seen every 76 years back to at least 240 BC. beginning in the mid-19th century, astronomical spectroscopy demonstrated that comet tails were giant streams of gas. We have detected lots of water (H2O), carbon dioxide (CO2) and carbon monoxide (CO), hydrogen cyanide (HCN), methyl cyanide, and numerous compounds containing sulfur, carbon, oxygen, nitrogen, hydrogen, iron, sodium and copper. 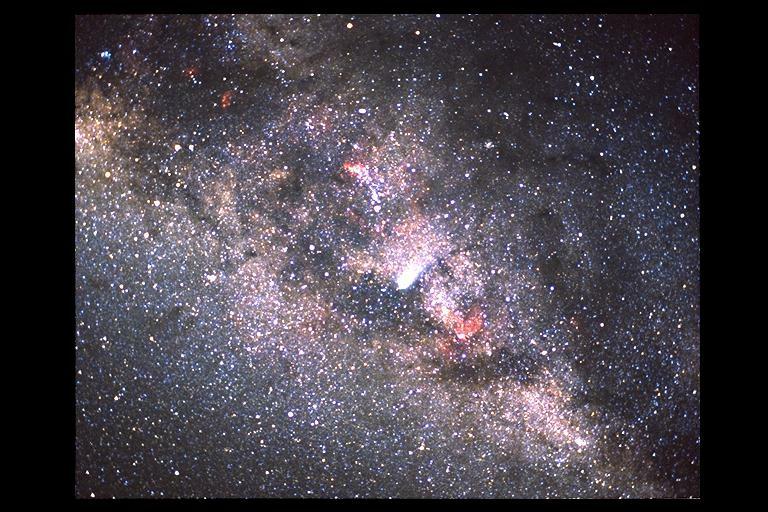 in 1950, Jan Oort used all the information on known comets to conclude that a) comets are part of the solar system, i.e., they orbit the sun, b) "new" comets have enormous orbits, with aphelia distances (furthest point in the orbit from the Sun) of 30,000 to 50,000 AU. These comets come from all directions (above, below the ecliptic plane). He suggested that there must exist a spherical cloud of comets surrounding the planetary system and extending about half-way to the nearest star. The total number of comets in the Oort Cloud may be upwards of 1000 billion (1012) objects. in 1951, Gerald Kuiper used all the information known about periodic ("short period") comets to demonstrate that they come from a region 50-100 AU from the Sun and are largely confined to the plane of the ecliptic. This is the Kuiper Belt. others speculate that there is likely an intermediate zone containing upwards of 10 trillion (1013) objects that replenishes the Oort Cloud. Now, what questions do we have? why is there an Oort Cloud and a Kuiper Belt? 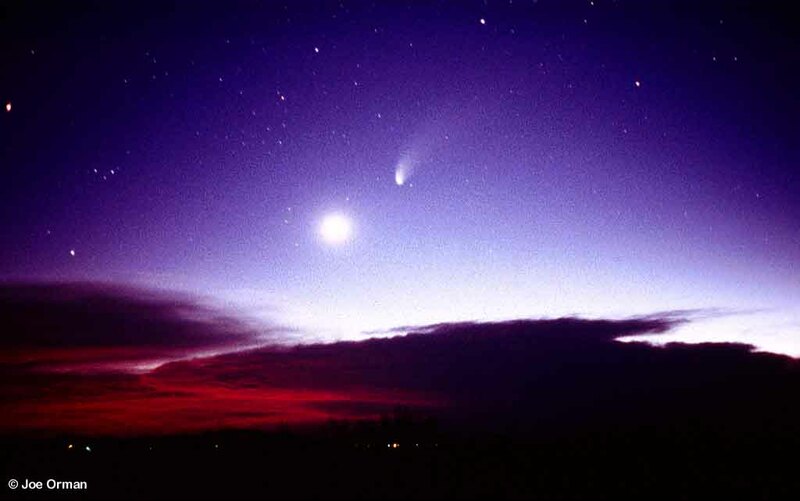 what happens to a comet as it loses material to it's tail? Fred Whipple, in the 1950s, proposed the "dirty snowball" model for comets. According to this model, comets are balls of dirty ice, where the ice is dominantly water and carbon dioxide ices. Normally, comets stay frozen, far from the Sun. But what happens when they come closer to the Sun? Beyond Pluto, the temperature of the surface of a comet would be below 40 K, or -233 C. At such temperatures, water and carbon dioxide are completely frozen. But what happens if a comet gets pushed out of the Oort cloud, perhaps by a passing star? If its orbit is changed such that it enters the planetary part of the solar system, it experiences increasing levels of exposure to sunlight. It warms up. Once it passes inside the orbit of Saturn, the sunlight is intense enough to begin to boil off carbon dioxide ices. Once it passes well inside Jupiter's orbit, the sunlight is sufficient to boil off water ice. Although dirt will not evaporate directly, streams of sublimating gases will rip small grains of dust off the comet's surface; however, the dust will preferentially be left behind. What should happen to these gases that boil off the surface? 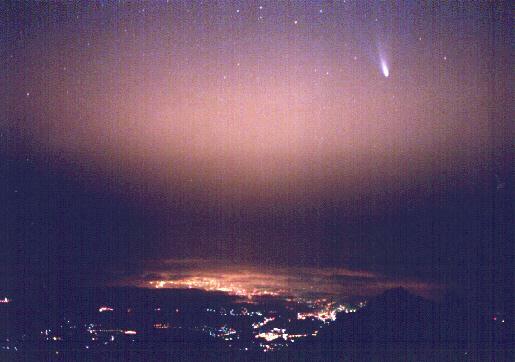 The comet gradually develops an atmosphere. 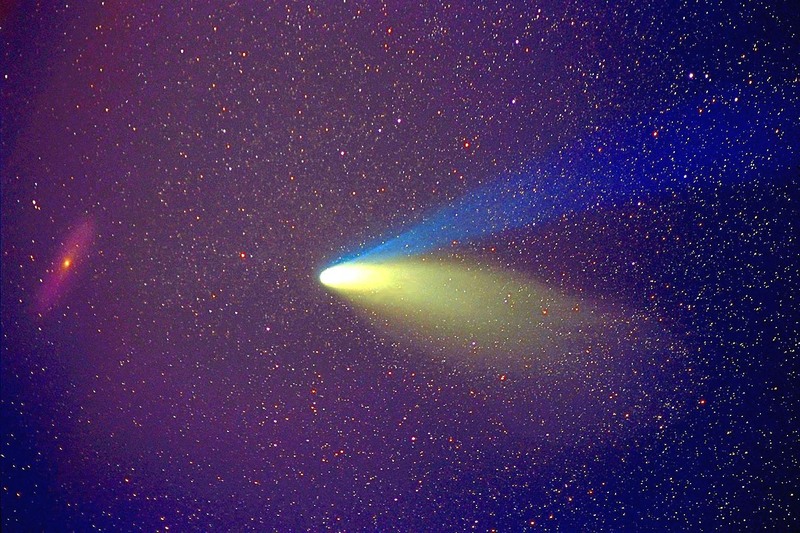 But why does a comet develop a tail? The atmosphere of the Earth is not ripped off and left behind in a tail as Earth orbits the sun. (This used to be used as an argument to prove that the Earth didn't move, didn't orbit the Sun.) So why should this happen to a comet? The answer is that 1) it would happen to the Earth's atmosphere if the Earth's gravity were as weak as that of a comet, and 2) it does not happen because the materials in the tail get left behind, or stop orbitting the Sun. In fact, all the cometary material continues to orbit the Sun. However, a wind made up of charged particles from the Sun blows past the comet and pushes charged particles from the comet away from the comet. This is how we discovered the existence of the "solar wind." In addition, sunlight (light or radiation pressure) pushes the uncharged grains of dust away from the comet because the comet's gravity is too weak to hold onto the dust grains. The ion tail is straight. The dust tail is curved. Meteor showers are short term events in which we witness a large number (a few per minute) of "shooting stars" for several hours. Shooting stars are small grains of dust that are swept up into the Earth's atmosphere as Earth orbits the Sun. The collision is quite violent and tears the dust grain apart into molecules. What do you see when you witness a shooting star? You are seeing a trail of glowing sodium atoms in the upper atmosphere. These atoms are not ones ripped off the interplanetary dust particle (IDP); rather, these are atoms resident in the Earth's atmosphere that are heated and glow due to friction with the passing IDP. Why meteor "showers"? All meteor showers are associated with the orbital paths of short-period comets. With each passage near the Sun, material stripped off the comet becomes a long, wide stream of particles orbiting the Sun, following in the orbital path of the comet. If the comet's orbit literally intersects the Earth's orbit, then every year the Earth will carve a path through the dust debris left behind by the comet. The Perseids (Aug 11 into morning of Aug 12) are associated with Comet Swift-Tuttle (due to return in 2030). The Draconids (Oct 10, evening) are associated with Comet Giabobini-Zinner. The Orionids (Oct 20 into morning of Oct 21) are associated with Comet Halley (next return, 2062) while the Taurids (Nov 7) are associated with Comet Enke (3.3 yr period). How big is a comet? We can observe comets before they develop their tails, when they are still in the outer solar system. We also have flown spacecraft past three comets, including Halley, and measured directly the sizes of their nuclei. As a rule of thumb, comets are about 10 km in diameter. 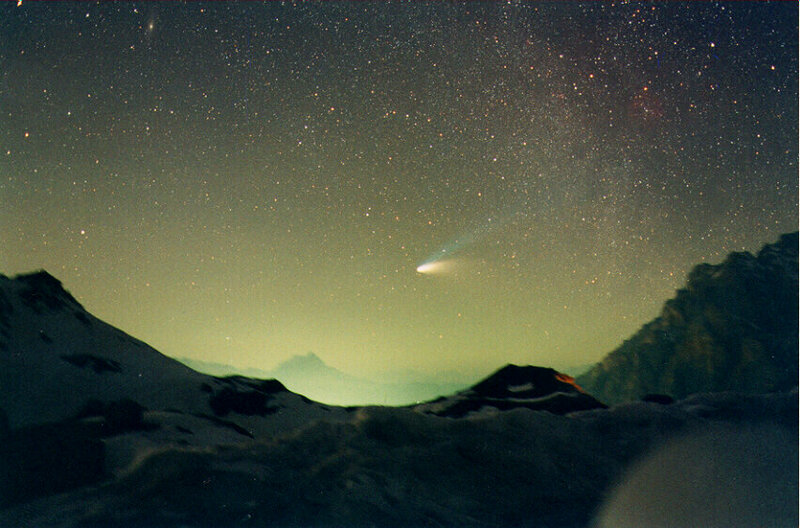 Halley is about 16 x 8 x 8 km; Hale-Bopp was one of the biggest comets every seen, with a diameter twice that of Halley. But the typical comet is about 10 km in size, but of course is odd shaped since such small objects will not be spherical shaped. What is the mass of a comet? Assuming a density of 1 gm/cc, typical for water ice, then this comet would have a total mass of 5 x 1017 gm = 5 x 1014 kg. The peak "mass loss rate" for Comet Halley was 30 tons/second of gas and 24 tons/second of gas (ice). This occurred at a distance of 1 AU from the Sun. Some comets get closer to the Sun and thus lose mass more quickly. Since comets are moving very quickly through the inner solar system, they only spend a few months in the part of the solar system where they are warm enough to sustain a substantial rate of mass losss. For argument's sake, let's estimate this time period as 1/3 year. Then, how much total mass does a comet like Halley lose with each passage through the inner solar system? And at this mass loss rate, how many passages can Halley experience? A real comet might not lose mass at the same rate with every passage by the Sun; however, the general idea that a comet has a finite number of passages before it gets used up is clearly correct. But a comet might "turn off" before being reduced to nothingness. Why? With each passage, ices are preferentially lost and dust is preferentially left behind. Thus, a comet will develop a surface layer that becomes enriched in dust, i.e., it becomes darker and a better insulator. Eventually, such a comet may turn so black and develop such a good insulating surface that it will turn off, continuing in its orbit but no longer looking or behaving like a comet. What is the implication of this lifetime for a comet, assuming Halley is typical? Clearly, comets can't do this forever. And if we accept the Copernican Principle, that this time in the history of our solar system is not special, then new comets have been appearing and getting used up for the entire history of the solar system. Assuming the solar system is approximately as old (or older) than the oldest Earth rocks (3.9 BY), the oldest grains on Earth (4.3 BY), the oldest moon rocks (4.4 BY) and the oldest meteorites (4.56 BY), then there must be a reservoir of comets where a comet Halley was preserved for 4.5 BY, only recently getting kicked out of the freezer and into the hellish conditions (for a comet) of the inner solar system. How much stuff is out there? Let's compare this to the Earth: 1027 kg / (6 x 1024 kg/Earth) = 166 Earths (or 1/2 Jupiters). This is a fair amount of stuff! What are the possible ramifications of our knowledge of comets? Comets are sources of water. One could think of comets as possible future sources of water (to bring to Earth or to a space station or to a planet like Mars). Alternatively, one could wonder whether the Earth's present abundance of water was deposited here by impacts with comets, early in Earth's history. The Earth's oceans contain 1018 kg of water. This is equivalent to 1 million (106) Comet Halley impacts. Comets collide with planets. 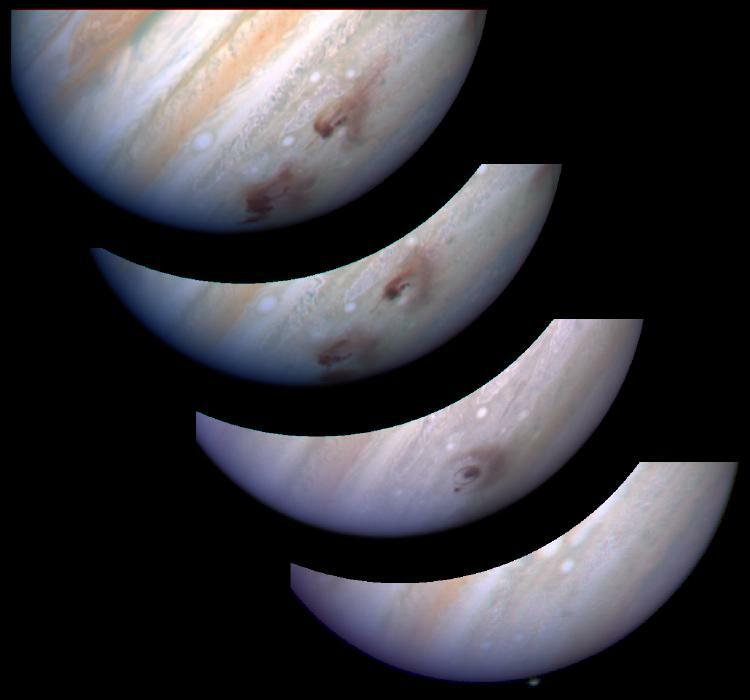 We witnessed the collision of Comet Shoemaker-Levy IX with Jupiter in 1996. This must not be a rare event (the Copernican principle). What would be the significance of a comet hitting Earth?